Household waste in Beijing increased by eight percent a year between 2005 and 2008, setting a record of 6.72 million tons in 2008. Only in 2009 did the city witness a decline - a small fall of 0.5 percent on the previous year - in the annual stockpile of garbage. Beijingers are generating around 18,000 tons of garbage a day at a time when the city is able to process 11,000 tons. According to the Beijing Municipal Commission of City Administration, the 6.72 million tons of garbage produced in 2008 had a volume of 16.8 million cubic meters. Wang Weicheng, the chairman of the Beijing Energy Conservation and Environmental Protection Association, estimates that in the next five to 10 years, Beijing will have no land left to bury garbage. 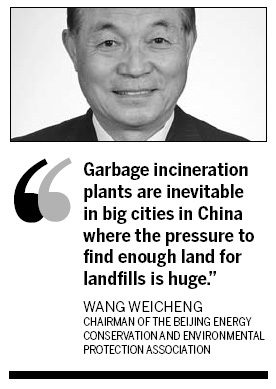 "Garbage incineration plants are inevitable in big cities in China where the pressure to find enough land for landfills is huge," Wang told METRO. He added that each city should be free to deal with garbage in the best way for that particular city. "In cities like Beijing, Shanghai and Tianjin, there is no way to continue the use of landfills as the main solution," he said. "After proper garbage sorting, incineration plants can not only reduce garbage but produce heat and electricity. We can transform garbage into new energy," said Wang, who participated in the drafting of a law on renewable energy in 2005. The construction of the Asuwei garbage incineration plant in Changping district is scheduled to kick off in Beijing this year, according to a municipal government document released in June. The building of the second stage of another incineration plant, in Shunyi district, will also begin this year. And plans for the Nangong incineration plant, in Daxing district, will also be advanced. Wang revealed that plans for the incineration plants date back to 1998 but the projects have been postponed again and again because of the public's concerns about dioxins. He said, in Western countries, where there is a long history of using such incinerators as a way of treating garbage, the plants were built long before the residential communities that grew up around them. "But in Beijing, when people have already spent 30,000 yuan per sq m to buy an apartment, it is not easy to persuade them to accept a nearby incinerator," he said. Huang Xiaoshan sent a short message to every journalist he knows on Saturday, aiming to give a heads-up about what he called "unbelievable news". He was furious at the government's guidance on household treatment, which has just been released on the official website of the Ministry of Environmental Protection and was asking for public comment by June 26. "A week is definitely not enough for people to express their concerns or offer advice," Huang said angrily, adding he has already proposed that the seven-day period be extended to three months. Huang, a successful lawyer, was detained last September for protesting against the proposed Asuwei garbage incineration plant near the salubrious Xiaotangshan resort area where he owns a multi-million yuan villa. Ever since then, he has remained focused on household garbage treatment and has gradually become a full-time environmental activist, government adviser and a media figure after leading local residents in repeated campaigns. For Huang, garbage treatment is a national issue regarding the safety and health of all Chinese. He believes that the recently released guidance doesn't have a clear position on garbage incineration plants, it only suggests that in cities, which are short of lands, incineration can be used to treat household garbage and the emission levels of toxic dioxin should be tested once a year. With the construction of the Asuwei garbage incineration plant back on the government agenda and a plan to have nine incineration plants in Beijing by 2015, Huang is becoming more and more anxious. "I'm not speaking against incineration technology. I just don't believe burning is a proper way to handle garbage in Beijing. Because the majority of household garbage here is kitchen waste, which is not suitable to burn," he said. He said that garbage treatment first requires sorting and recycling as much as possible. "If the government can push garbage sorting forward, I'm sure we can cut back 30 percent on household garbage production by 2015, even 50 percent," Huang said. He is worried that the proposal to build more incineration plants is a sign that the government doesn't seriously consider making garbage-sorting the main treatment option. Where some people see a pile of rubbish, Mads Moller envisions a promising energy source for the future. It is an unavoidable fact that Beijing must use incinerators to handle garbage as its landfills swell, said Moller, managing director of COWI China. "The current smoke depollution technology has no difficulty to process the hazardous emissions if you can afford the huge investment," he told METRO, responding to questions about toxic dioxins that may emanate from incineration. He said the so-called "smoke depollution" system usually accounts for 30 to 50 percent of the cost of a whole waste-to-energy unit. "During incineration, the pollution from the trash moves into the flue gas and the slag. The flue gas gets cleaned through several processes and the clean smoke is emitted via a 152-m-high chimney," he said. "All the emissions meet the EU regulations and the nearest residential community is about 500 m away from Vestforbraending," he said. The plant is responsible for about 15 percent of all waste management in Denmark. The Copenhagen plant has a capability of 600,000 tons of garbage per year and all the heat is utilized in the Copenhagen region. The waste has been used as a renewable energy source in many countries for decades. The use of heat generated from waste-to-energy plants has increased in Denmark since 1980. About 30 solid waste incineration plants operate in the country. COWI, one of the biggest engineering consulting groups in Denmark with 6,000 employees worldwide, has participated in the construction of dozens of waste incinerator projects in Europe, including the largest waste incineration plant- a combined heat and power generation facility - in Northern Europe. No matter how advanced the technology of garbage incineration, no one can guarantee dioxin-free emissions, said a retired expert previously with the Chinese Research Academy of Environmental Sciences. The expert, Zhao Zhangyuan, 67, an activist and a leader of the anti-incineration movement in Beijing, believes deeply that the health hazards from these plants outweigh the benefits. Dioxins are dangerous chemicals known as persistent organic pollutants with high toxicity. "They can accumulate in people's bodies and linger for a long time, increasing the chance of getting cancer," he said. "Dioxins can hardly be avoided once burning is chosen as the way to cope with garbage." The Likeng incineration plant in Guangzhou was cited as an example. Zhao said about 200 villagers near the plant contracted cancer within four years of the plant opening. "A lot of statistics show that people have a greater risk of cancer when they live near a garbage incineration plant," he said. The national standard for a safe distance from an incineration plant is 300 m. The number of people who get cancer within 1,200 m of an incineration plant is twice the number of people who contract cancer outside that circle, Zhao said. "Some experts argue that as long as garbage is burned at between 360 and 850 degrees Celsius, hazardous emissions, including dioxins, can be destroyed within seconds," he said. "In practice, it is very difficult to control the burning temperature," Zhao said, adding sometimes workers cut costs by not using enough fuel to maintain the proper temperature. 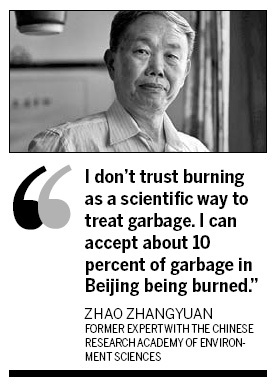 "I don't trust burning as a scientific way to treat garbage. I can accept about 10 percent of garbage in Beijing being burned," he said. Beijingers produce 18,000 tons of garbage per day while the city has the capacity to deal with only 11,000 tons of it. Currently, two percent of the waste is treated in the two operating incineration plants in the city. Beijing is expected to have 40 percent of waste incinerated by 2015 as seven more plants come online. incineration plants in particular - to tackle the garbage crisis. They are plans that are being vigorously opposed by residents living near existing or planned waste incineration projects. Government guidance on the treatment of household waste released on June 19 says cities that are short of land should consider garbage incinerators as a way to tackle the mountain of trash. But anti incineration activists oppose the government's suggestion and regard it as a signal of where the government stands on the issue.